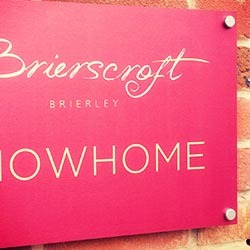 Dibond is a cost effective type of signage often used for shop signs, directory signs, property development and car parks. Dibond is a very rigid but lightweight aluminum composite material, consisting of polythene core and aluminum cover sheets. With waterproof inks your sign is suitable for all weathers and will last for years. There are many advantages of using this type of Signage. Aluminium Dibond signs are normally used when strength is important. Dibond is very temperature stable, very flat and offer great resistance to physical impact. 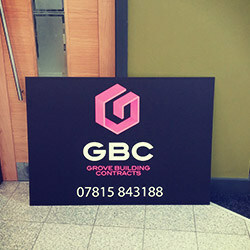 Dibond signs are a cost effective way of covering large areas of space and be printed with any design and fixed to the wall directly or with Stand Offs. At Dock Street Signs we are able to cut exact sizes of Dibond specified by clients to create the perfect aluminium signage. We can also include features such as built up letters, flat cut letters and vinyl detail which is particularly popular for Shop signage. Below is an example of our prices for Dibond based on some popular sizes. We are one of the cheapest in Leeds, if you find it cheaper anywhere else locally – let us know and we will match the price where we can. Other sizes, options and finishes are available so please get in touch for an exact price. Our designers can help produce the artwork for Aluminium Dibond Signs. Our installers can also visit your site to put up any signs if you don’t feel confident doing it yourself. If you are looking for a Dibond Sign in Leeds then fill in the quote form below and we will get back to you with a price. 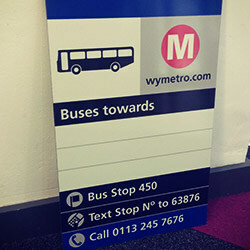 Alternatively call 01133226442 or email info@dockstreetsigns.co.uk. We also offer other external signage, internal signs, rigid media, vinyl and event media.